Chakkiligintha can be pretty confusing. And some time during the movie, we ended up wondering whether the movie was directed by Sukumar. For, Sukumar is the director who makes love stories that are more psychological case studies and succeeds bloody well at them. We were actually not too much off the mark since Vema Reddy, the director of Chakkiligintha, is the person who wrote the dialogues for Sukumar's first big film Arya. While many did find Arya confusing, it was Sukumar's deft hand that made the movie the hit it was. For his debut directorial venture, Vema Reddy chooses a storyline similar to that of Arya. Only, he is unfortunately no Sukumar. While Arya's protagonist believed in one-sided love, the concept propagated by the protagonist of Chakkiligintha is Avoid Girls. 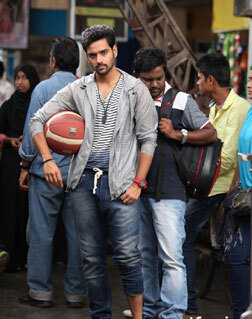 Adi (Sumanth Ashwin) believes strongly that boys should avoid girls at all costs. This would make the girls run around them instead of the usual scenario where the guys run after the girls, is the idea. Enter Avantika aka Avi (Rehana), a girl who promises all the girls in Adi's college that she will make Adi break his own rule, and restore normalcy to the college. Whether Avi succeeds in making Adi break his rule and how normalcy is restored forms the rest of the flick. Chakkiligintha is an extremely confusing film - and the confusion begins right from the name of the film. The title makes you think this one is a comedy, but it is anything but one. Casting Viva Harsha does not guarantee laughs, and you realise this very early in the movie - sadly, the director does not seem to until the very end. Then, the characters are quite inconsistently-scripted - they preach something and do something completely different in the very next scene. The dialogues are also confusing, and the fact that the leads are not really phenomenal at emoting makes them more difficult to understand. While Sumanth Ashwin does a decent job, Rehana's lip sync (or the lack of it) makes it quite difficult for the audience to follow her dialogues. The least the director could've done while giving her very long lines was to ensure that at least the beginning and the end of the dialogues synced with the lip movement. The rest of the supporting cast do a good job. The technical values are superb. The film has an absolutely glossy look, and the limited locations of the college and the hero's house are used very well. The music is good, but the placement of the songs is not. Shoehorning in a sad song when about 5 minutes of the film are left is just plain infuriating. Chakkiligintha is a misnomer for a film that attempts to deal with the psyche of boys and girls from today's generation. The movie neither tickles your funny bone nor makes you put on your thinking hat - it might just end up making you pull your hair out. fullhyd.com has 700,000+ monthly visits. Tell Hyderabad what you feel about Chakiligintha!